The March Musical Mania Grand Finale: Which Song Should be Crowned Champion? Help your favorite song win! Just two songs remain from our bracket of 64 beloved contenders, "Over the Rainbow" from 'The Wizard of Oz' and "Happy" by Pharrell Williams. Your votes will determine which song takes the March Musical Mania Championship title for 2014. Will it be the century's … Read more about The March Musical Mania Grand Finale: Which Song Should be Crowned Champion? Vote for Which Two Songs Should Compete in Our March Musical Mania Finale! Our category contenders are: "Theme from Swan Lake," representing Classical & Jazz, vs. "Over the Rainbow," representing Movies & Musicals, and "Happy," representing Pop & Rock, vs. "Bless the Broken Road," representing Country & Christian. Vote for your finalists now! What … Read more about Vote for Which Two Songs Should Compete in Our March Musical Mania Finale! March Musical Mania Epic Eight: Vote for Which Category Champs Move On! And then there were eight! Vote for your favorite song remaining in each category to go on to our Fantastic Four, and compete for March Musical Mania Tournament of Songs Champion. Last round of voting was our closest yet. "Over the Rainbow" won by the thinnest margin possible, a single vote kept … Read more about March Musical Mania Epic Eight: Vote for Which Category Champs Move On! March Musical Mania Super 16: Vote for Which Songs Continue On to the Epic Eight! Only 16 songs remain in the running for March Musical Mania Tournament Champion! Vote for your favorite song in each head-to-head match-up below to determine which continue on to our Epic Eight. You also may still fill out a printable song bracket to follow all the action. We've seen some close … Read more about March Musical Mania Super 16: Vote for Which Songs Continue On to the Epic Eight! March Musical Mania Round Two: Vote for Which Songs Continue On in Our Tournament! 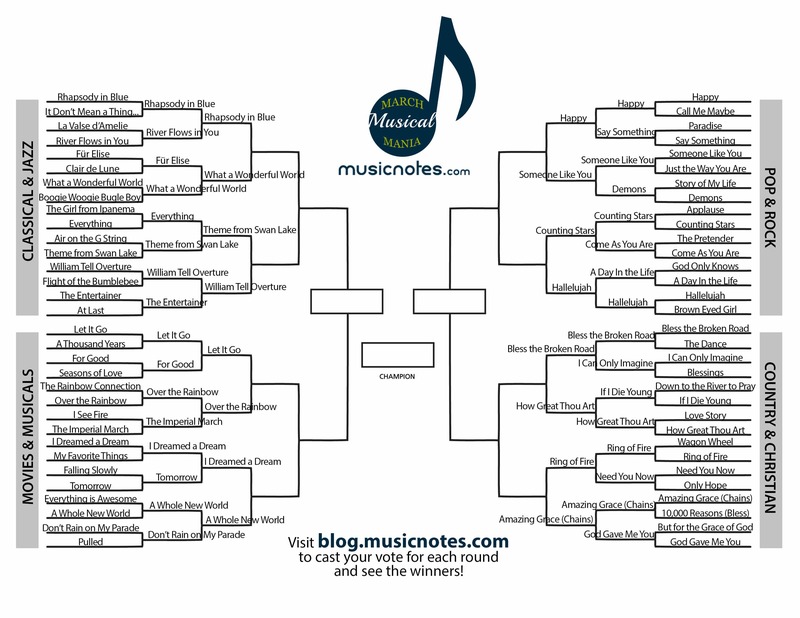 Round 2 of voting in our March Musical Mania Tournament is underway now! Vote for your favorite song in each head-to-head match-up below, fill out a printable song bracket, and help decide which song will be crowned the 2014 champion! You will continue to narrow down the contenders for 4 … Read more about March Musical Mania Round Two: Vote for Which Songs Continue On in Our Tournament! Play March Musical Mania: Vote In Our Tournament of Songs! We've organized the most major of song showdowns to celebrate tournament season. Vote for which song you think should continue in the "big musical dance" today, fill out a printable song bracket to follow along with the fun, and see which song is crowned tournament champion on April 11th! There … Read more about Play March Musical Mania: Vote In Our Tournament of Songs!